Browse: Home /	Urban Planning / Zoning out the Chain Stores? 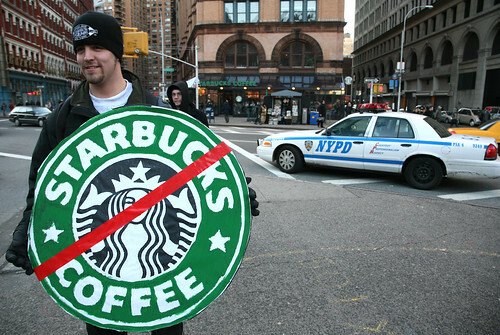 I just read about this on a blog called Community Based Planning, where the question is posed: “Could Formula Retail Zoning be in NYC’s Future?” A group called the East Village Community Coalition is spearheading an effort to protect their neighborhood from further takeover by Starbuck’s et al. Since commercial uses in NYC are already regulated by zoning, and considering the recent attention to this issue and concerns that chain stores are pushing out small businesses and causing NYC to lose its character, is this an idea whose time has come? Zoning has proven to be a hot topic around our area these days, as the recent Imagine Flatbush 2030 community visioning meetings have illustrated. Landmarking vs. no landmarking, upzoning (denser development near transit, generally perceived as sustainable) vs. downzoning (preserving century-old Victorian homes, generally regarded as an asset even by us apartment dwellers), more/different amenities vs. retaining the neighborhood’s diversity and character… similar conflicts and discussions are taking place all over the city. What’s your view?